The ‘unplugged’ show at the book release went pretty well today. The rain turned out to be a non-factor – the sun was actually more of a problem – it got pretty damn hot out! But still, the drummerless (Clay had prior commitments) played a pretty nice acoustic set down in the schoolyard. Definitely a configuration that merits revisiting if the show dictates it. I watched Die Another Day in the afternoon. Bond is fun. I never rush out to see a new Bond film, but generally enjoy them when I do see them. The Madonna theme song was god-awful, however, and while Halle Berry’s character was alright I don’t see the need to spin her off into her own film. She wasn’t anything special. 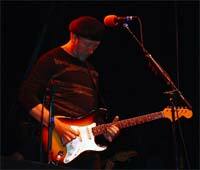 The main event of the night was Richard Thompson at the Toronto Star Blues Festival. I appreciate the irony of having an artist as far removed from the blues as RT is playing a “blues” fest – anyone listening to his utterly unique folk/celtic/rock-influenced playing would know in a second that there’s nothing from the Delta in this man’s music. Having missed him in concert at least three times in the last four years, I was really looking forward to finally witnessing him play live, and was not disappointed. The man is simply a guitar god, no one can touch him. Though you’d not know it from listening, he’s been a tremendous influence on me… I bought my acoustic guitar because it looked like the Lowden he was using at the time, and my Telecaster has the same unusual pickup configuration as his Ferrington. And as otherworldly as his playing is, his songwriting and singing are just as good. If I have to pick highlights, I’d go with the obvious – “Shoot Out The Lights” – and the encore solo acoustic performance of “1952 Vincent Black Lightning” Am I gushing? A little? Good, I mean to. Did I take pictures? Yes, I did. Did you see Tegan and Sara as well? nope. barely got there in time for RT biking like a madman from my place to the CNE. I wanted to but I got lazy at home watching movies and getting dinner.